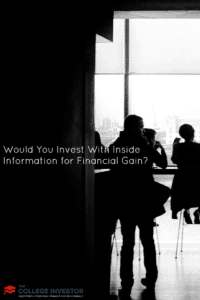 Home » Would You Invest With Inside Information for Financial Gain? When most of us hear the term “insider information,” our ears perk up. It’s taboo among personal investors to even mention the phrase at times, but that’s because most of us never seem to get any good insider information. Generally, the people with that kind of knowledge are CEOs like Martha Stewart or high-ranking company officers, and I bet they know how to use it. If anyone thinks the CEOs or board of directors at Fortune 500 companies aren’t using inside information, you are putting a lot of faith into the top 1% of our society. Regardless of whether you think it’s right or not, I bet it probably happens more often than you might imagine. How many stories have we heard over the past few years of executives taking huge bonuses even though their company was laying off workers or bailed out by taxpayers? These people don’t get to the top by having solid character and strong moral fiber, trust me. If we assume that insider trading is going on, then how on earth are so many people getting away with it? We rarely hear stories about insider trading anymore and I think the answer is pretty simple. Just think about the millions of trades, if not more, that occur each day. How the hell is someone supposed to pick out an insider trader out of millions of transactions? That responsibility falls squarely on the shoulders of the Securities and Exchange Commission (SEC). I can’t speak to the efficiency of the SEC but I do know how efficient other government programs are. Been to the DMV lately? If that’s even 1/10th efficient as the SEC then you have your answer. Honestly, I’m surprised anyone’s ever caught since it’s so easy to have someone else make the purchase for you or do small amounts to not get noticed. Obviously if you get greedy and do it with a few million dollars that might raise some red flags. Just What is Inside Information? I worked for a Fortune 500 aerospace corporation for four years and our stock price was constantly going up or down based on our earnings reports and whether we were winning new programs or not. I was a lowly engineer but everyone liked to gossip a lot about our end-of-the-year bonus (based on company revenue) and whether we would be winning any new programs or not. Honestly, most of the time the rumors were true. I don’t think this would be considered insider information but I could have definitely made some money off the happenings at my company this way. Let’s imagine I was in more of a manager role — involved in high-level meetings with VPs and in on the calls with potential customers. Since a lot of employees own company stock what should they do if they find out the company is not going to win that hot new program? They know that once it’s announced the stock price will go down at least a couple percent if not more. I’ve never been faced with this type of situation but I do know for a fact that this is insider information. I would probably be too scared to do anything in that situation since most people know the penalty for insider trading is jail time. But what if I heard it secondhand from someone who was in the meeting? Even though that is probably still considered insider trading, it’s up to me to believe the source or not. I think most people would be more willing to make a trade based off reliable secondhand information since it doesn’t feel like you’re doing anything wrong. I’ve already mentioned Martha Stewart since she’s clearly one of the biggest examples of insider trading. If you’re not familiar with the case, she was sent to jail for five months for selling $230,000 worth of ImClone stock, a drug company that was about to have their latest drug rejected by the FDA. She was only caught because the executives at ImClone all sold tens of millions of dollars of stock right before the FDA announcement. Even the geniuses at the SEC could connect the dots and figure that one out. But the reason why I bring this example up is that we all know how severe the penalty is for insider trading because of this case. People break the law every day, whether it’s jaywalking or littering, but we’re scared of insider trading because of stories like this. We know we probably won’t even get a ticket for illegally crossing the street. Stewart ended up doing five months in jail and had she not sold her stock, she would have taken nearly $50,000 in losses. I’m sure she had to pay the money back but would you risk $50,000 for five months in jail? If I was a millionaire like Martha Stewart, I sure as hell wouldn’t but if my 401(k) was at stake, I might have to think twice about it. Readers, would you invest with firsthand or secondhand inside information? Do you think the SEC would really catch you and prosecute you for insider trading in amounts under $10,000? What about $50,000 or $100,000? Wow! Have you got ANY moral compass? Hmm I guess not?? I tend to have less moral compass when it comes to dealing with big businesses(think government, walmart, wall st) but more when dealing with small businesses(mom and pop shops, private owned, etc). I treat other people how I want them to treat me, don’t expect much from the big guys but I do from the little guys. Having insider’s information on a certain company could be great as long as you don’t get caught but it can really hit you in the end knowing that you’re cheating on other people and yourself too. Yea but who exactly are you cheating? The person on the other end of your transaction? They’re going to buy/sell the stock you sell/buy regardless so I don’t think you’re cheating them are you? This is one of those tough questions which is easy to dismiss until you are in that place. I would like to think I would not use it. Finally a little honesty. It’s really easy to say you wouldn’t do it until faced with the situation. If your investment is about to lose $5,000 and all you have to do is hit sell and no one will ever find out, I bet a lot of people might do something different. Insider trading is and should be illegal. A number of years ago a client left a job as Marketing VP at a small, but publicly held company. He sold his stock simply because he wanted to be done with the company. The SEC came after him for insider trading and he wasn’t prosecuted but the legal bills were still there. That case is absurd or course, but I think anyone who intentionally trades on insider info and gets caught deserves to have the book thrown at them. Just curious, why do you think it should be illegal? I think there are a lot of laws on the books that we come to just accept because they’re there. Not sure this is the case here but I’m not convinced it should be illegal, who exactly is getting hurt by insider trading? I’m very curious to hear your thoughts. Harry I’m completely and totally dumbfounded by your question. Do you honestly think that it’s OK for insiders to manipulate the price of stock up or down for their own profits? Who gets hurt by it? Everyone. Again I’m just amazed that you don’t see anything wrong with it. While things don’t always work the way they are supposed to and certainly some get away with it, this is a BASIC tenant of a fair stock market. Your question is at about the same level as asking …What did Ryan Braun do wrong? I don’t think it’s ok, but I think it does happen. That’s why I proposed the question, if you were given first or second hand insider information, what would you do? I’m not sure what I’d do but to be honest, I would be tempted. Harry I am astounded and appalled that you even need to ask this question and that there is any doubt in your mind as to the answer. Another take on this would be to ask you whether or not you think what Ryan Braun did was wrong and whether the public consternation he is getting is justified? To me cheating and lying is cheating and lying. This is a really interesting hypothetical. As easy as it would be to become an inside trader, I feel like it would also be easy to make someone look like an inside trader. One of the many reasons I prefer index funds is that I can never be accused of insider trading. Yea I’m definitely an index fund kind of guy too but it’s fun to think about things like this. Again, this situation is hypothetical in case there are any IRS agents lurking haha. I think it would be really difficult not to invest with insider information, but I wouldn’t do it. It’s too risky. Putting everything on the line is not worth it just for some money, in my opinion. Yea that’s a great point Daisy, I think ultimately I’d probably do the same.